This weekend, my family reminded me that I had yet to share a look at a couple of little treasures my mom gave to us. 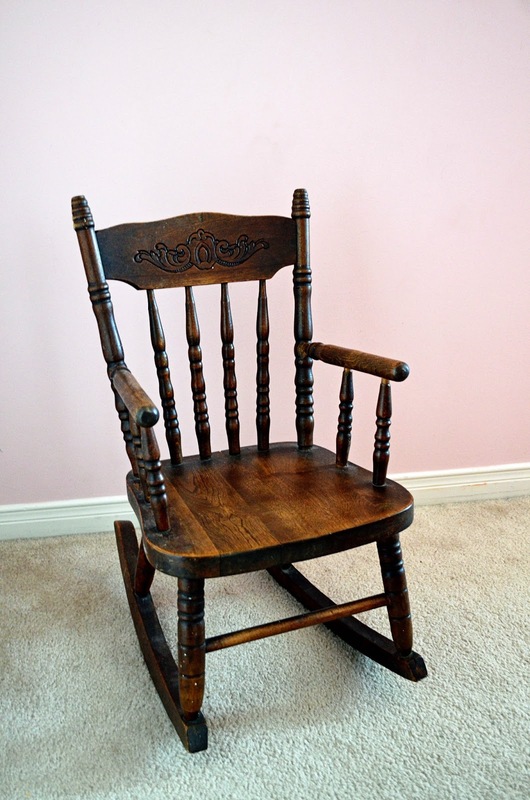 This antique child-sized rocking chair was my mom's chair when she was a little girl. With apologies to Mom, if my childhood stuff is now "vintage," Mom's childhood stuff is antique. I have an adorable photo of my mom sitting in her chair as a child, but I can't recall where I stored it at the moment. My brain is in the vintage category too. 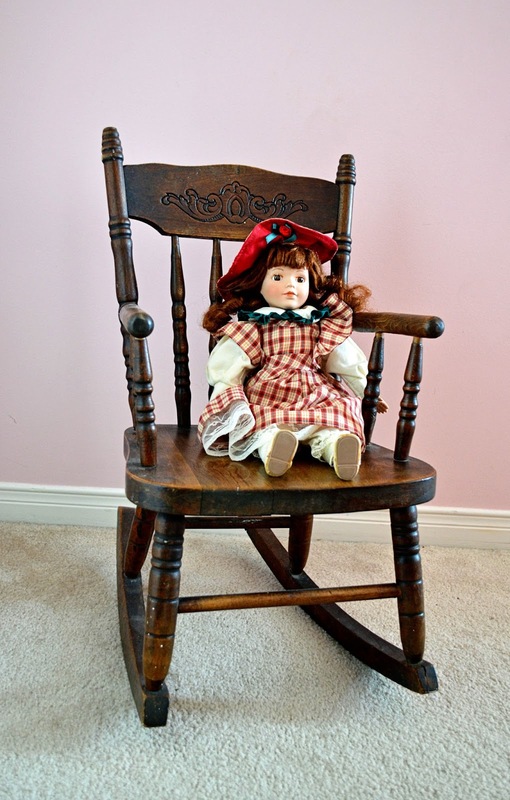 Just to give you an idea of the size of the rocking chair, here is one of my daughter's dolls sitting in the chair. 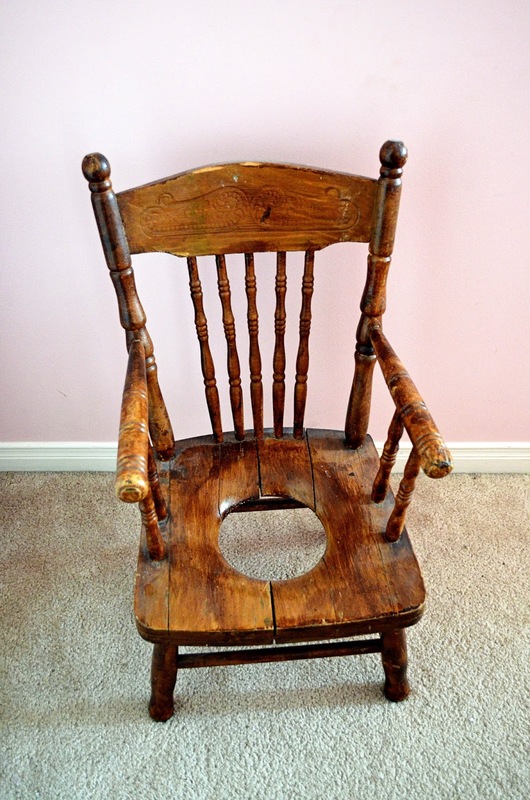 And here is Mom's potty chair. And you thought it was hard cleaning that little plastic potty chair! Do you have any similar family heirlooms? How lovely to have family heirlooms like that! I bet Ikea stuff won't survive long enough for our great-grandchildren to use it! I guess the closest thing to a family heirloom we have is an old upright piano from the 30's that my mom inherited from a family friend. It's in fabulous shape with the exception that it needs to be re-keyed. If I had the room for it I would have probably already begged my mom to let me have it! My parents own a ridiculous amount of antiques, like 80% of their possessions are antique, but very few have been passed down from family members. I have countless family heirlooms, but maybe not as many as you! Crazy little potty chair. Thank goodness for the little plastic ones! I have way too many family heirlooms, but like you, I truly treasure them. I love your little chairs -- so sweet. It's impossible to part with them, isn't it Heather? PS My blog has moved from Blogger to WordPress. Hope you can still find me! Thanks Holly! The arm is loose, but otherwise it's pretty good. Your Mom's rocking chair is in such good shape. She obviously took very good care of it. It is also a testament to how well furniture was made back in the day. I believe they were stored away when I was a kid too, under the steps, behind a false wall! Beautiful chairs! I have a few treasures, but mostly my mom still has all those goodies since our space is limited. These are lovely. These are so sweet!! Between stuff I've brought here and the other house full - I have plenty!!! Those are so sweet! It's really great that they have survived for so long. My Grandma gave me a rocking chair for my son that was used by my Aunts, Uncle and Mom. She bought it from a prison furniture shop in Maine in the 50's. The chairs are so special. How wonderful to have them from your Mom. I have my Mom's highchair. Both my girls sat in it and I'll have my grands sit in it also. Thanks for joining TTF.